The Homematic IP Switch Circuit Board enables the integration of common electrical devices into the Homematic IP smart home system. For retrofitting, the tiny circuit board only needs to be placed in a suitable position of the device housing and has to be connected e.g. with the existing button or signal input. 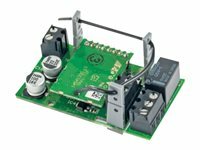 A miniature relay allows switching capacities of up to 30 V/1 A. If the relay is not used, it can easily be broken off from the board. Thus, the size of the circuit board is still reduced and instead the open-collector switching output with 30 V/0.5 A can be used. Once installed, conventional household appliances, light installations, own µC applications or even garage door drives in connection with the Homematic IP Access Point can be switched via Homematic IP app, remote control or wall-mounted push-button.